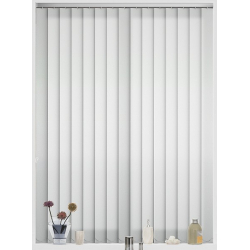 We have a wide range of vertical blinds available, which are the ideal solution to larger windows and patio doors. They also work great in all other windows within your home and can give you a choice of multiple colours, textures and even designs. 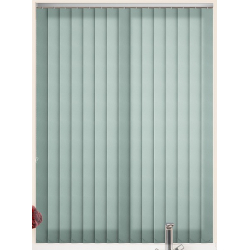 Having vertical blinds within your home will help you to take control of the light coming into your rooms, simply rotating the blind will help you to allow just the right amount of sun through whilst giving you a good amount of shade. 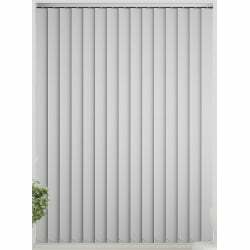 There is a wide range of options to choose from, whether you are looking for a blackout vertical which will help to block out the glare from the sun as well as providing a complete shade. 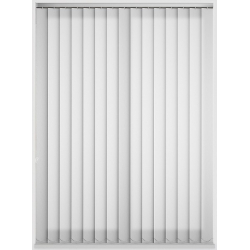 We have a range of thermal, energy saving vertical blinds which will help to dramatically decrease the cost of your heating bills. Not to mention helping to keep your space cosy and warm all year round. With our PVC collection helping to give a durable and strong feel which makes them perfect for use in kitchens and bathrooms. We love it when our customers are happy. 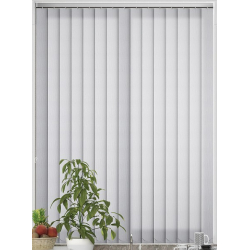 Whilst these stunning vertical blinds allow for you to have great light control, but they are able to fit seamlessly into any space within your home. This being due to factthe we offer a large range of neutral tones, which work in any space. Whether you are wanting to play around with patterns or have something that is plain, we are proud to offer a varied range no matter your preference. 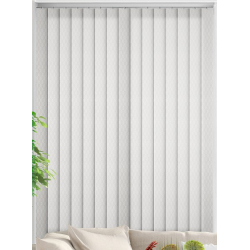 Our white, natural and neutral range of vertical blinds will be a great fit for any home. Vertical blinds are not only practical but can be vibrant too, take a look at our range of delightful colours for some great ideas. With a number of textures, plains and even jacquards all available in a number of shades which will help you to ensure they fit perfectly with your home’s colour scheme. Not forgetting that they will still allow you to take complete control over the light that comes into your space. 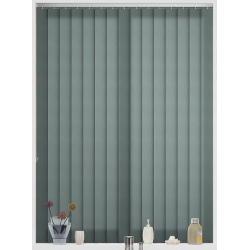 With the elegant and stylish neutral tones available in our range of blackout vertical blinds, offering the highest of sophistication. Whether you are looking for a plain, subtle design or textured, you will certainly be able to make a big impact on your home’s décor. Also, with the blackout backing, they will be great to help keep the bright sunlight at bay. With a blackout vertical blind, you can have complete control over the amount of light that comes into your space, especially when the sun has started to outstay its welcome. It can be completely blocked out instantly with a simple twist of the control rod. With a lively range of colours available, you can help to compliment your home perfectly. 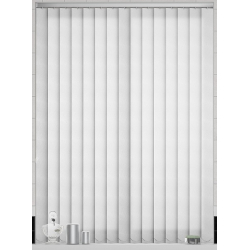 The range of energy saving vertical blinds contain a specialised fabric which helps to reflect any heat which would be potentially lost back into your home. This will help to reduce the amount of heat lost, keeping your rooms warm and helping to decrease the amount you pay on your energy bills. Our collection is currently available in a wide range of colours with a number of great woven textures. 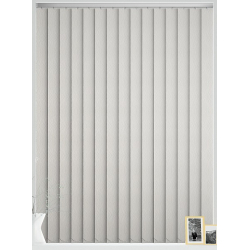 Our PVC vertical blind range are great for the modern home. They are incredible strong and durable, with a semi-blackout lining. Not to mention that they are 100% water resistant, which means they are a great practical alternative to the traditional fabric you usually see in these blinds. They are a great addition to any room in your home, including the conservatory. 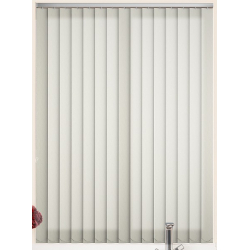 All our PVC blinds are one of the toughest vertical blind collections we have, made using these highest quality PVC available, they are incredibly durable. Some may say that they are almost indestructible! This style of vertical blinds are very popular for use in the bathroom and kitchen, as they are completely waterproof and are very easy to clean. 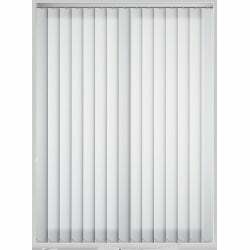 Of course, you want to know that your stylish vertical blinds are safe. 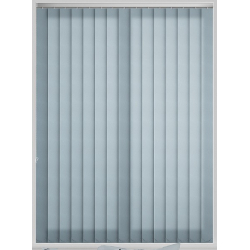 That’s why we offer a flame retardant range of blinds which comply with British Standards for School & Offices, BS5867. These will help to give you peace of mind if you are looking for extra safety. 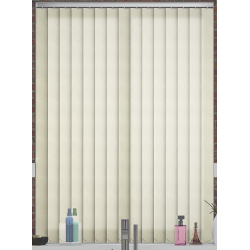 As well as being extremely safe, these blinds are stunning, what more could you need? Our White Vertical Blinds collection is definitely a great choice if you are looking for a clean and simple look. Helping to give you complete control of the light in your room, this style of blinds will certainly help you to coordinate your interior with a huge choice of neutral tones available. 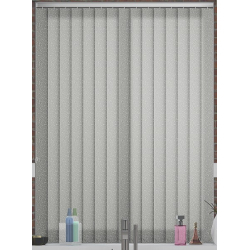 Whether you are wanting to spice things up with a pattern or stick with the plain and simple blind, we have the range of vertical blinds for you. 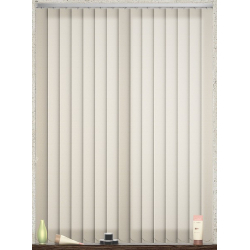 These blinds are simply made up from a number of individual fabric slats which have the ability to be tilted and drawn, all using a child safe wand or a dual beaded chain. Whichever option you choose, you will be able to filter the sunlight through and even fully close your blinds for full privacy or shade. You can have your blinds so that they are drawn to one side or split evenly on your window, to help give a more balanced feel. Blind cords can be a real safety hazard, so we supply all of our blinds with a cord tidy which will help you to keep your children safe, giving you complete peace of mind.